The Location should be spacious, full of light and reflects your aesthetic. What atmosphere is best for you? Depending on your personality, you may want to have a quiet and relaxing morning to prepare for the day. Maybe this vision includes just a couple of your closest friends or maybe you want a rocking party atmosphere with a room full of people. There is no right or wrong way to do it- as long as you are comfortable. After all, it is YOUR day! Whatever you decide, let your bridal party know so they can respect your wishes. There are lots of options to choose from when selecting a location to get ready in, make sure you choose one that will reflect the look and feel of your wedding day. You may have spent hours selecting the perfect ceremony and reception location and you will want to select the getting ready location with the same care. Finding a location that is close to the ceremony site will make your day much less stressful, after all, no one should have to endure a traffic jam on their special day! If you are celebrating your wedding ceremony or reception at a hotel, then utilizing the suites they have available is a great way to cut down on transport time, allowing you to enjoy the day and all of your hard work. Certain hotels will even offer a room or suite with their wedding packages so make sure to discuss this with the hotel ahead of time. If the room they offer isn’t what you had pictured, you can always opt for an upgrade. And if your bridesmaids are staying at a hotel the night before the wedding – consider have a “sleep-over” with them and then using that space to get ready the next day (didn’t we all just love sleep-overs as kids?!) Another option is to see if you can check into the honeymoon suite early and primp in style! A hotel room is not only convenient at saving time but it also is a great mutual ground to celebrate your extra special day. The rooms will be full of light, have luxurious clean lines, and less clutter which helps make for beautiful backdrops that will highlight your happiness throughout the day. While it might tempt you to get ready at your home (or your parent’s home) this can create a bit more stress with lots of extra people “peaking in”. Plus, no one wants to have to make their own bed on the morning of their wedding! For many couples however, getting ready at home adds an element of sentiment to their day. Whether it’s the house you share with your future partner-for-life or the house you grew up in with your parents, it can be extra special to spend your last unmarried moments in this space. Being in a familiar surrounding can help calm your nerves and if you realize that you’re missing something, it will be much easier to find at home than at a hotel! If you do decide to get ready at home, it is super important that you carefully consider the room so we can create the best getting ready photos as possible. Clean lines and clutter-free backdrops are a must. This will allow you to be the focus of the images. Rooms with lots of natural light streaming in will result in the most captivating images. 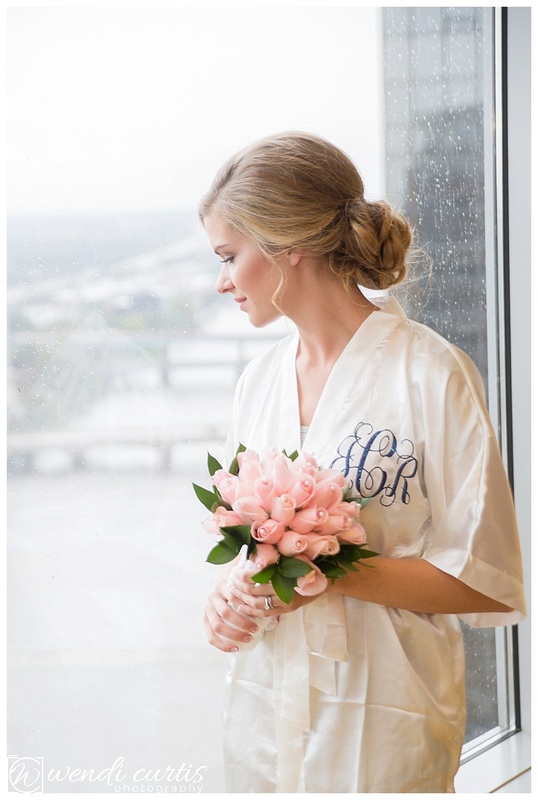 Don’t allow the getting ready space be a mere afterthought — you’ll be spending a significant portion of your big day getting primped and pampered there. Whatever location you choose, there should be plenty of space that makes everyone feel comfortable and relaxed which will create the best possible start to the best day ever! Wherever you choose to get ready on your wedding day, make sure to have all of the special details together so that I can document all of the little things that were so carefully thought out. Important things to bring together are your: invitations, rings (don’t forget the Groom’s! 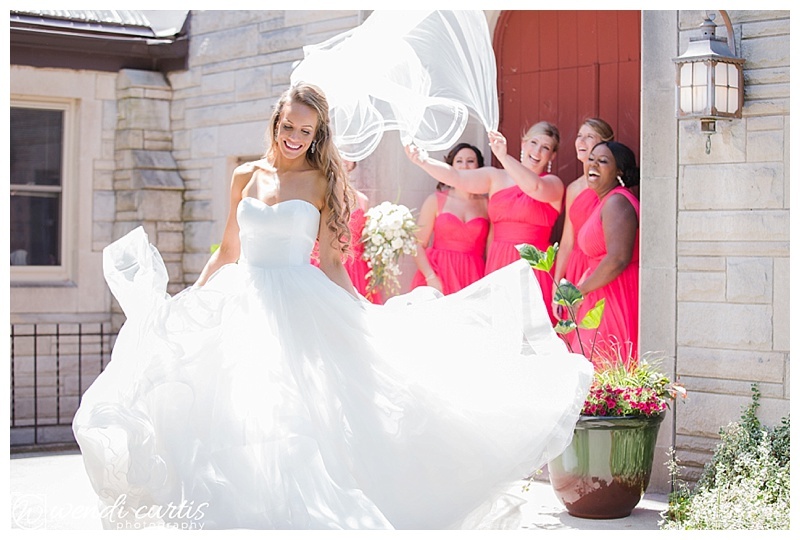 ), veil, shoes, wedding gown, perfume, jewelry, flowers and any other details that you want captured on your big day. 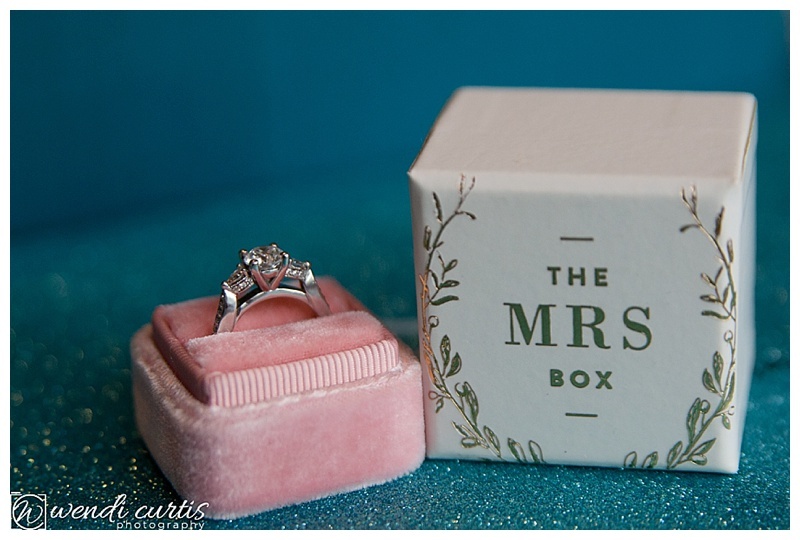 Having a unique ring box can help your ring pictures really pop. 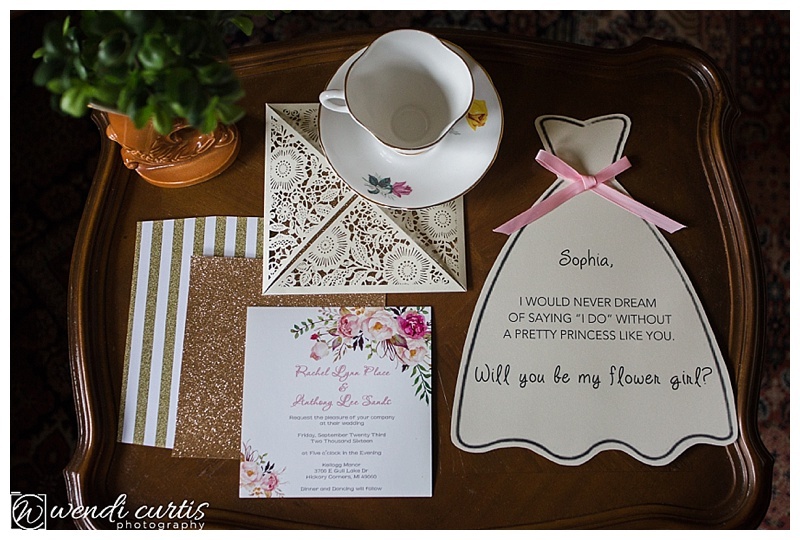 Quick tip: having two sets of your invitations makes my job much easier so that I can photograph both sides at once. Make sure to take tags off everything, including your jewelry, veil, gown and shoes. A pretty hanger can show off the beauty of your gown before you get into it. A great place to find custom hangers is Etsy or a simple yet classic wooden hanger works great too! And finally, make sure that your bouquets and boutonnieres are delivered to the getting ready location for when I arrive. That way I have enough time to capture them before the first look! When you’re getting your hair and makeup done, you’re not going to be in your gown. So what should you wear? A quick cruise through Pinterest will have your inspiration ideas flowing! It works best to wear something that you can easily take on and off without having to drag it over your head (and mess up your carefully crafted hairstyle!) Robes and button-down shirts work really well for this. 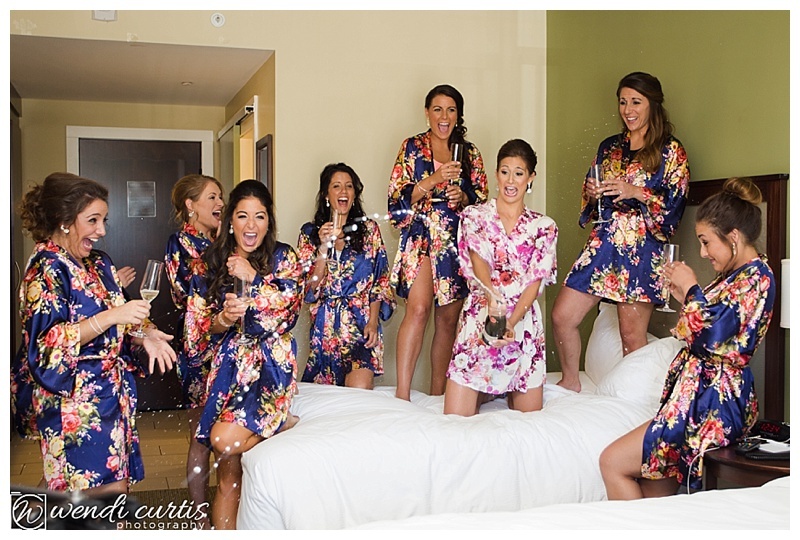 And BONUS, these robes or coordinating shirts make great bridesmaid gift ideas! If your wedding gown is strapless or backless, one thing that most brides forget is to not wear a bra the morning of your wedding. Wearing a bra will leave strap marks indented into your skin which I can promise don’t make the pictures of getting into your dress any better! You can choose to have your hair and make-up done at a salon or have the stylist come to you. If you’re traveling to a salon make sure to add extra time for travel. If the stylist is coming to you and there are more than four people getting hair and makeup done, make sure that they are bringing an assistant. Some stylists recommend that the Bride should be the last one pampered. I prefer that you go more in the middle of the group. This helps if the stylist is running a bit behind, we can begin getting you dressed even if all of your gorgeous girls aren’t photo ready yet! 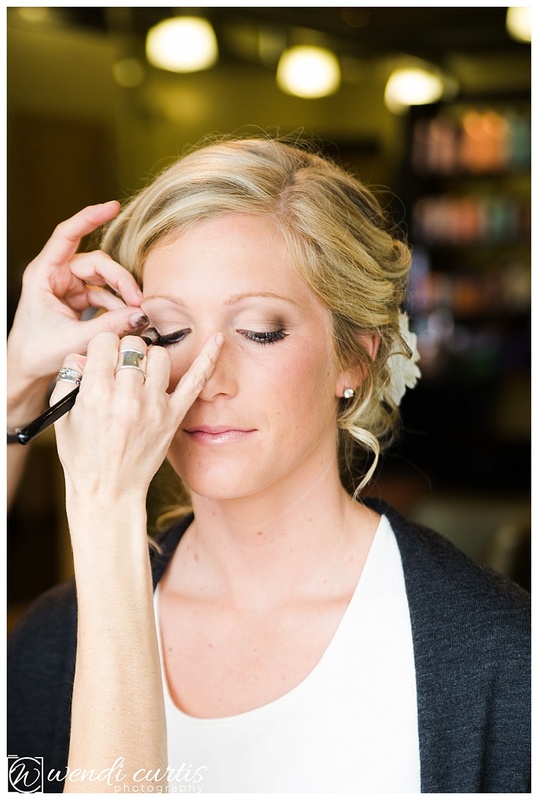 Hair and makeup artists are human and could be running behind your carefully crafted schedule. Therefore, I recommend to all my brides that you plan to be finished with hair and makeup a minimum of 45 minutes earlier than necessary. No bride wants to be late for their own wedding! It is good to know how much time it will take to get into your dress: whether it is a quick 10 seconds to zip it up or maybe over 20 minutes to secure each and every button. A great tip is to bring the person that will help you get into your dress on your wedding day to your final dress fitting appointment. Then you can both practice getting into the gown and see how long it takes. The seamstress can also teach you how to bustle the gown which you will certainly appreciate later on in the night! Make sure that your mom is dressed and ready for the day when you go to put your dress on. I’m pretty sure every mom would agree that she would much rather be wearing make-up and in her stunning dress than in a t-shirt and jeans for those special photos. 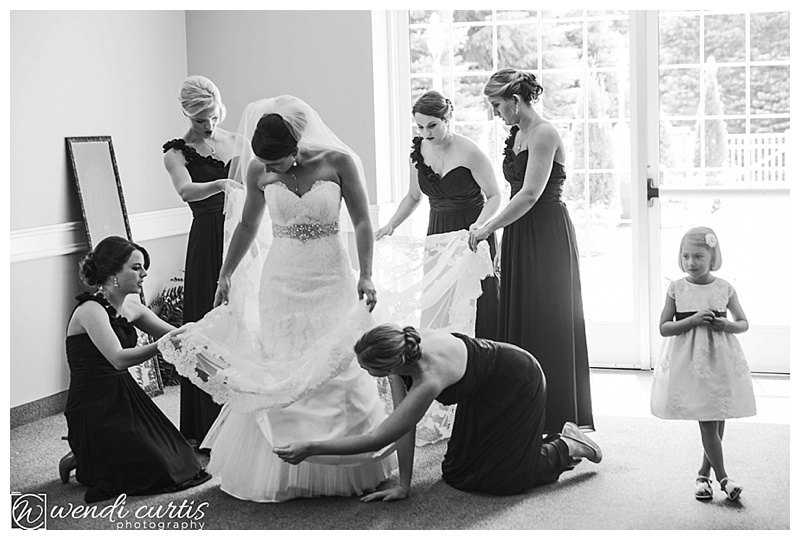 Anyone who is helping you get into your dress should be all gorgeous and ready too! With your helpers by your side (and after you have used the bathroom- trust me you will thank me later), it is time to put on the dress! I will make sure to find the brightest, most photogenic area for you to put on your gown. Once you have gotten situated with undergarments, I can capture your helpers zipping/strapping you in. After the dress is on, you can have others assist you putting on the veil, jewelry and shoes for more photo opportunities! A gift or card exchange with your future spouse is not only a beautiful gesture on your wedding day, but also a great opportunity to capture those emotionally-charged moments that create beautiful photography. The gift doesn’t have to be a lavish item, but more importantly something that comes from the heart and will remind them of this moment for years to come. I can’t tell you how many times I have seen the wedding party go hungry! It’s such an easy thing to forget because it’s something that fits so naturally into our everyday routine. But on your wedding day, your regular daily routine is going to be off – way off – so it is best to plan for food in advance. I can guarantee that the day will fly by and you’ll suddenly be feeling super light-headed and realize that you haven’t eaten anything – don’t let anyone faint from hunger during the ceremony! I usually recommend a platter of bagels, cheese, fruits, pastries, muffins, etc. Foods that are easy to grab and eat without much need for utensils or plates. Keep it simple and you’ll keep everyone very happy. Water bottles are also a must as it is important to stay hydrated! If you don’t have a way for food to be delivered to you, I’ve found that this task is a great one for Dads to take over so that they stay busy in the morning! Oh, and don’t forget the champagne! Toasting before getting into your dress makes great photos! Make sure a bridesmaid or your coordinator has a safety kit in case you need something. Great things to include in the kit are: stain removal (‘Tide To-Go’ pens or wipes are awesome), small scissors, a mini sewing kit, hairspray, safety pins, bobby pins, energy bars, gum, breath mints, q-tips, band aids, tampons, deodorant, makeup remover and Advil. Trust me, when Brides come prepared it makes the day much less stressful! The getting ready shots are just as much about the details as they are the candid moments so above all: enjoy yourself. Let me do my thing and try to pretend I am not there. Know that all of your hard work and preparation will help the day run smoothly. Feel the emotions of the moment and trust that if I need something from you, I’ll ask. 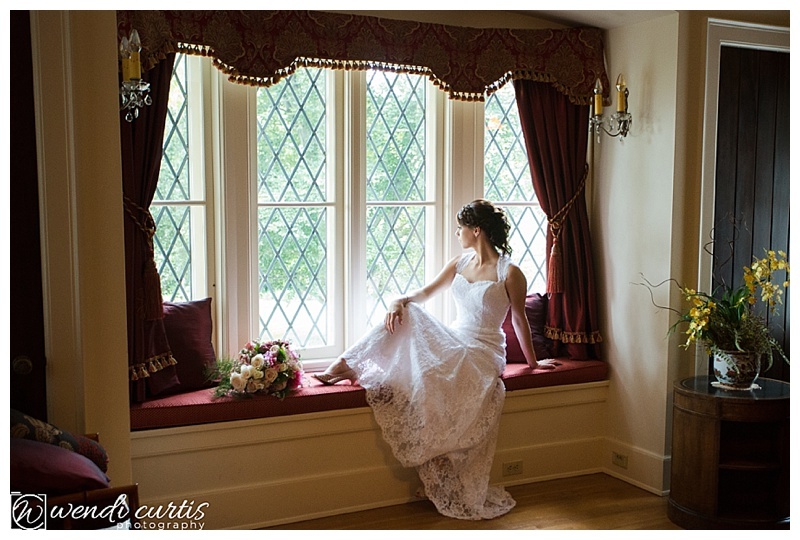 It is a natural feeling to get nervous or stressed the morning of your wedding. Remember if you are feeling stressed, take a deep breath, relax and enjoy the moment. Twenty years from now, you won’t remember the small snag in your bridesmaids hem or that your schedule was off by ten minutes. You will remember the way that you laughed and danced around the room with your closest friends, the way they toasted to you and your soon-to-be husband, and the way you felt when your Groom turned to see you for the first time in your gown. Together we will capture those moments, and you will be remembering this story for the rest of your life. Keep Calm and Marry On! !